We make various leather ammo pouches for you to carry spare magazines. Our leather Most Versatile Pouch, the most popular choice for carrying spare ammo for revolvers. It is deceptively simple and a very inconspicuous way to carry a Quick Strip or loose cartridges for a quick reload. For auto loaders, we offer several different options. 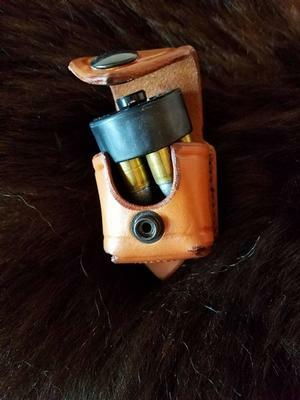 The most convenient is the Single Magazine Pouch, designed with a loop on the back and snaps for a quick attachment on your belt. The CID magazine pouches slide onto your belt with belt slots like our pancake holster design.